Aeroengine companies are working to meet challenging requirements for emission and fuel consumption reduction. 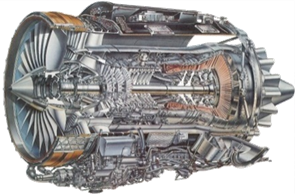 This effort includes the further refinement of the component design processes including aerodynamic compressor design which is characterized by a time-consuming blade geometry finding process. 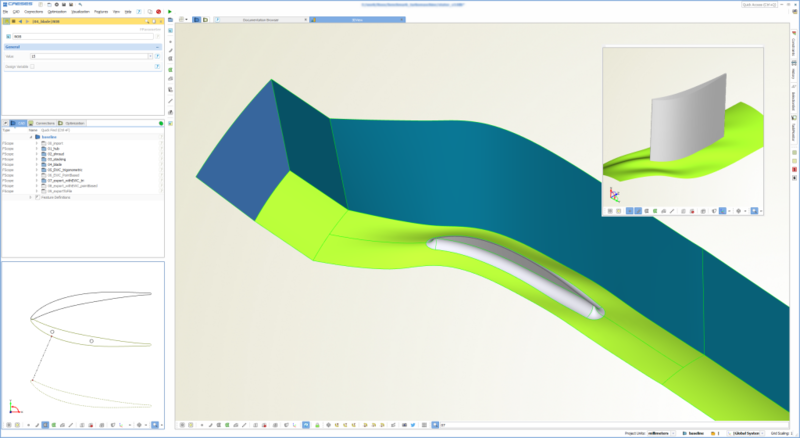 Many design iterations between different design tools for geometry generation and numerical flow analysis are required in order to achieve the best blade geometries which fulfill the global design intent and meet the global performance requirements. Two different design and optimization approaches where chosen for comparison purposes: RRD based its 3D model on a 2D section optimization where finally the best 2D sections were used for 3D blade surface generation. 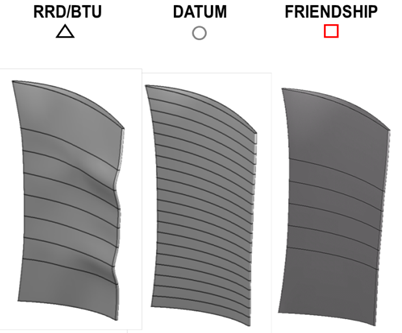 FRIENDSHIP SYSTEMS had chosen to design a parametric 3D blade model where its radial distributions ensured that, when looking at the manufacturing process, only feasible designs got created during the automated variation process. There is a published paper available which describes this study in detail. Simply get in touch with us if you would like to receive this paper as pdf. Compressor blades for aerodynamic shape optimization can be modeled with CAESES® which additionally comes with the possibility to connect and run integrated studies with CFD. Note that any type of blade (axial, radial, mixed) can be created and fully customized with CAESES®. The geometry models include the periodic CFD domain along with fixed & colored patches that are ready for automated meshing procedures. Do not hesitate to drop us a line if you have any questions regarding blade design, or see the turbomachinery section for more details. We can e.g. support you in setting up parametric models for shape optimization in just a few days – uncomplicated and fast.